Invite your best buddies over to your Atlanta, GA apartment for a fun taco party! Whip out the guacamole and the diced tomatoes, and don't forget your favorite salsas. Check out these tips to make sure your taco fiesta is just as entertaining as it is delectable. Having to run back to the kitchen to heat up ground meat, shredded chicken, nacho cheese sauce, or refried beans every few minutes can be an inconvenience. To make sure you can eat and enjoy time with your guests, set up crockpots on your bar or counter to hold the taco ingredients that are best served hot. To make sure your guests have easy access to toppings and fillers as they build their taco masterpieces, set up all the ingredients buffet style in a logical service line. For example, tortillas and crunchy shells should be at the beginning of the table, along with plates and service ware. Next, would be your hot filler ingredients and then the rest of the toppings or sauces. Consider setting up labels or paper tents for the ingredients for an added buffet feel. Let guests know what your taco buffet will consist of so that they can bring their desired items. Your guests will enjoy trying new additions to their tacos they may have never considered. 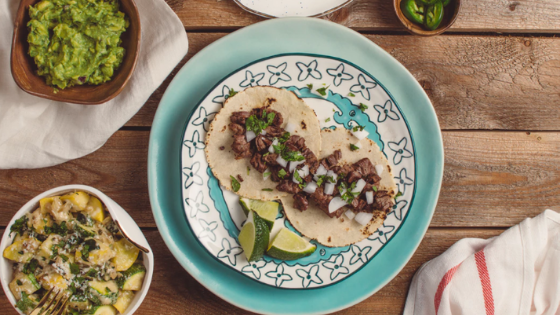 Taco night is bound to be a crowd pleaser for a fun dinner at home. Check out the apartments we have available if you want a place to call home where entertaining your quests is enjoyable and comfortable!